Long known as highly beneficial for a healthy body, cold-pressed pumpkin oil has a very distinctive taste, colour and smell. It is rich in Omega 3, Omega 6 and unsaturated fatty acids. It also contains many vitamins including A, E, B complex, Zinc and Celine which all contribute to improved health. Pumpkin oil is rich in phytosterols which contain anti-tumour and anti-inflammatory properties and have a positive impact on the immune system. 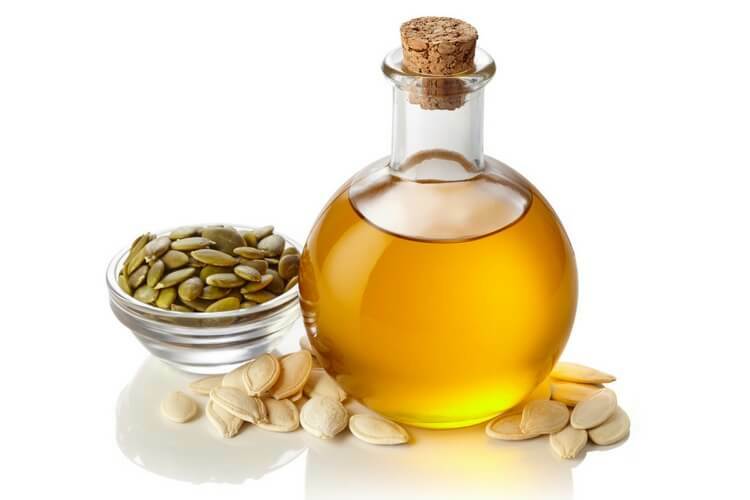 Taken internally (two – three teaspoons three times a day) pumpkin oil stimulates digestion and, because it contains selenium, helps reduce the effects of aging. Regular intake of pumpkin oil can also help stabilise the metabolism, reduce inflammation, accelerate tissue regeneration and improve the appearance of skin. It can also promote recovery of the liver and biliary tract functions. Pumpkin oil is often used as a base for salad dressings and a popular ingredient for a wide variety of sauces. Cold-pressed and unrefined sesame oil has a very soft, individual taste and smell. It is made by the pressing and fine filtration of hulled sesame. Unrefined sesame oil is rich in essential fatty acids as well as vitamin E, lecithin, potassium, magnesium and phosphorous. 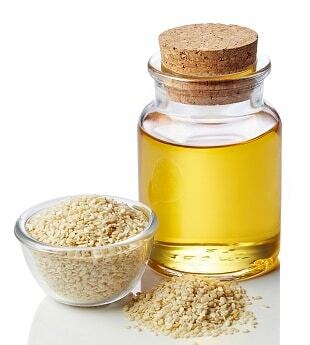 Cold-pressed sesame oil has many constituents that slow down cell aging and help protect the body from many conditions including atherosclerosis and diabetes. Due to its content of lecithin, it improves the activity of brain cells and is recommended for the treatment of depression and fatigue as well as for overall body strengthening. Sesame seed oil is widely used to enhance the flavour of salads, vegetables, fish, rice and other dishes by dressing them immediately before serving. 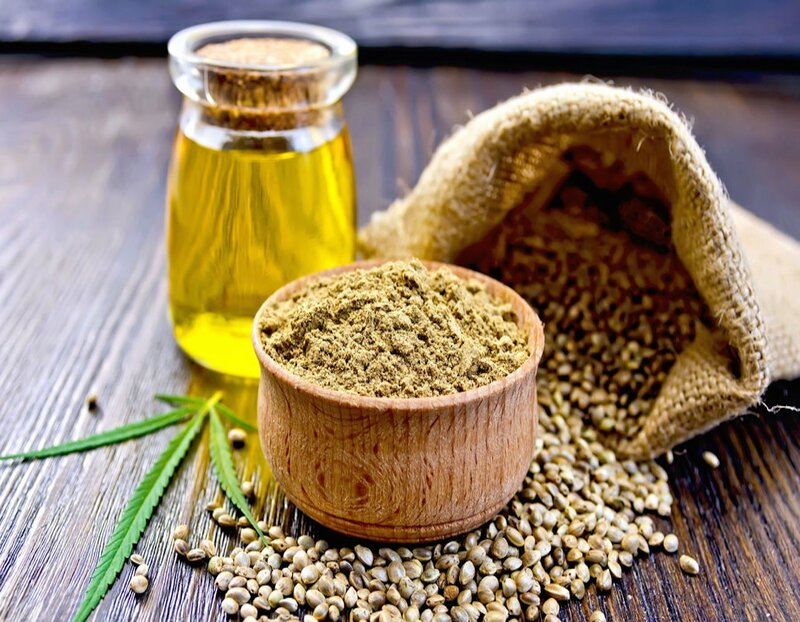 It is also used in the preparation of herbal extracts or as an essential massage oil and, by massaging the heels with the oil before bedtime, it has been shown to help cure insomnia. In the East, sesame oil is a primary ingredient in the medicine Ayurveda which removes toxins from the body through massage, gargling, nasal absorption and other means. Sesame oil has an extremely long shelf life due to its high antioxidant properties which do not turn rancid. Unrefined sunflower oil or ‘sharlan’ has the unique flavour of sunflower seeds from which it is made. The oil is produced by cold pressing specially selected, high quality peeled sunflower kernels and then applying a process of fine filtration. The absence of any chemical additives and the purity of the production method ensures all the valuable nutrients of the oil are preserved. Unrefined sunflower oil is extremely rich in Vitamin E, Omega 6 and Omega 3 essential fatty acids which are an important part of the daily dietary intake they can help prevent a number of diseases including cardiovascular conditions, hypertension, arthritis, asthma and autoimmune disorders. Just 14g of unrefined sunflower oil contains 43% of our daily requirement of vitamin E which is an active antioxidant neutralizing free radicals. Vitamin E also controls the function of hypophysis and so inproves the metabolism and the health of sexual organs. As a fatty-soluble vitamin, it adjusts adipose metabolism helps maintain the efficiency of muscles. Consumption of food cooked containing unrefined sunflower oil reduces potential problems of the gastrointestinal tract and aids digestion. It can be used in all kinds of cooked dishes, sauces and salad dressings. 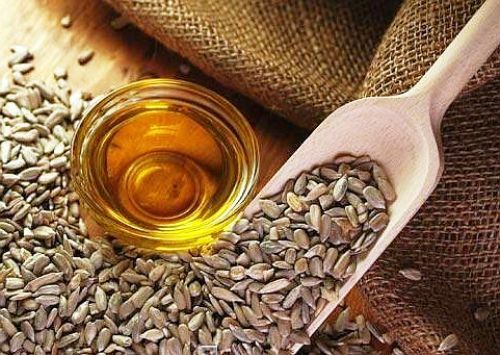 Flax seed oil is produced by the cold press of high quality flaxseed at low temperatures in specially darkened production facilities. The resultant oil is immediately packed in dark glass bottles to protect it from oxidation and safeguard its maximum usefulness. Flaxseed has been known as a healing herb since ancient times. First cultivated in Europe, the plant’s brown seeds were regularly used to prepare balms for inflamed skin and mixtures for the relief of constipation. 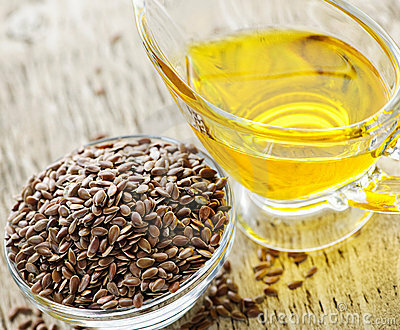 Today, flaxseed oil (also called linseed) is known to have several therapeutic properties. Just two to three tablespoons of flaxseed oil provide around 58% of the body’s daily need of Omega 6 and around 14% of our requirement for Omega 3. These essential fatty acids cannot be synthesized in the human body and can only be obtained through regular intake. They support the functions of the cardiovascular system, the immune system, nervous system and can be beneficial within the reproductive process. The consistent consumption of flaxseed oil may also reduce the risk of cancer and help protect against the effects of aging. It has a beneficial effect on the symptoms of menopause, menstrual cramps and can improve the condition of skin, hair and nails. Flaxseed oil contains a significant amount of plant hormones called lignans. These are important herbal agents that act like hormones and have the ability to connect with our own hormones to help maintain their optimal levels of performance for good health. Flaxseed oil is suitable for salad dressings, sauces and for adding to warm meals just before serving. The flaxseed oil contains a significant amount of plant hormones – lignans. Lignans are important herbal ingredients that act like hormones in our body. They have the ability to connect with the existing hormones and maintain their optimal levels required for our good health. It is suitable for salad dressings, cheese seasoning, etc. Do not overheat! Add just before serving warm meals. Walnut oil is obtained by the cold pressing of walnut kernels followed by a process of fine filtration. This time-honoured method protects the oil’s rich nutritional value for maximum therapeutic efficacy. Walnut oil is rich in vitamins A and E which have a positive effect on eye-sight. It also has a high content of essential fatty acids which can only be gained through regular intake. In addition to helping the efficient absorption of fats, these unsaturated fatty acids are proven to help prevent the development of atherosclerosis. Walnut oil is also an effective antioxidant and helps sustain the healthy function of several bodily organs. Taking just two to three tablespoons of the oil a day can help protect against premature aging, assist in the prevention of cardio vascular disease and act as an effective anthelminthic. 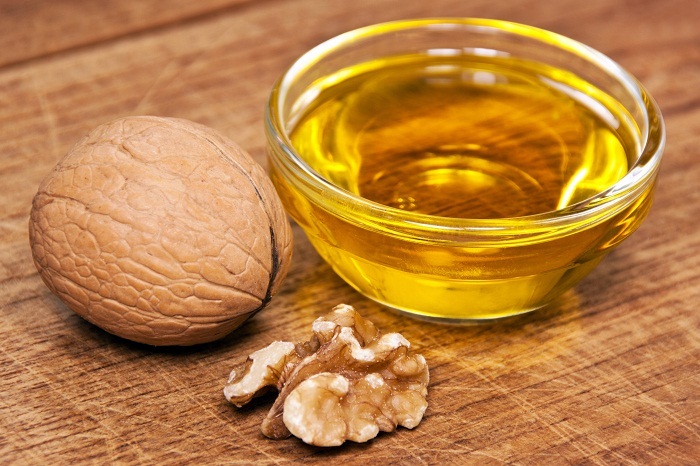 Walnut oil improves the nutritional value of all foods. It is perfect for salad dressings and a superb ingredient for soups, sauces and all kinds of pastes.